Have you ever wanted to capture video that you see online? Say for example you want to capture a highlight play on NFL.COM—which has some very high quality video clips online—integrating the results into your own video. I was looking for just such a solution the other day and found iShowU HD, a nice little application that can capture virtually any video you can view on your Mac, including Flash based videos from YouTube, etc. 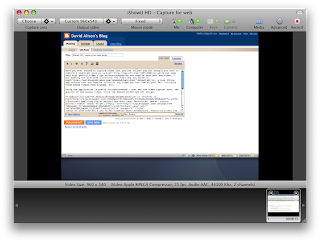 iShowU HD also provides a way to put together basic screencasts, capturing either the entire screen or just a portion of it while scrolling the viewport with the mouse movement. It can display mouse clicks with a radar-like circle animation and audible click. The only problem I’ve had with it was that recording audio (narrating my video capture) had a technical problem with my USB based microphone; it only recorded to the left channel. Shiny White Box—the manufacturers of the software—assured me that a fix would be coming for that within the next month. Fortunately the built in mic on my MacBook Pro doesn’t have the problem so I can work around it for now. For $30 it’s a nice little piece of software. I haven’t done too much research on the topic so if you’re aware of a good piece of video capture technology—including something for making screencasts—please drop a note in the comments.